The main purpose of H-300 Central Monitoring System (CMS) is to monitor self-contained emergency lighting luminaires. In an extended version (H-300 DYN) the system additionally controls dynamic emergency lighting luminaires. The basic system consists of H-312 main control and monitoring unit, functionally identical H-310 (IP65) and H-311 (DIN rail mounted) network expanders and luminaires of type CTB, CTL or older of CT typeT. 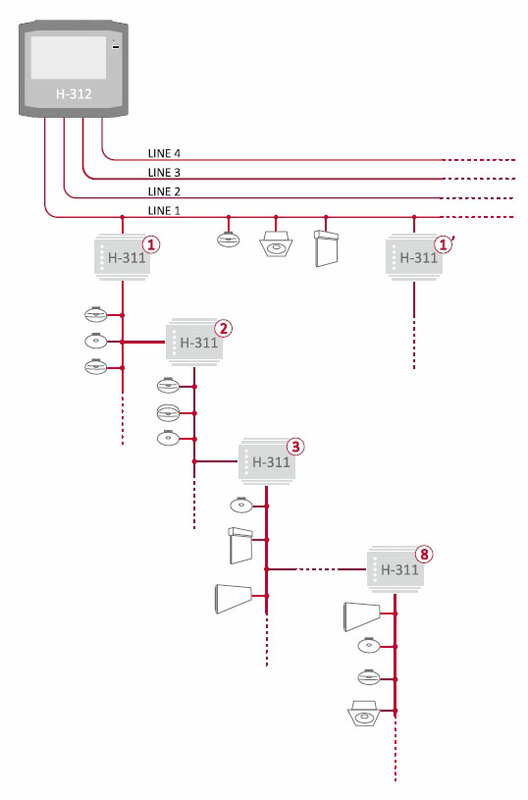 The H-312 unit is equipped with four communication lines operating concurrently that may be software configured either for the CT-BUS (CTB) or CT-LOOP (CTL) network topology. A compatibility mode for old CT type luminaires and H-302 R distributors is also present. All H-300 system components are addressable and have a unique factory configured and non-changeable hardware address. Beside the hardware address each networked device has a linear logical address (1 - 65535) and a physical address representing the physical route from the main unit to the device. Logical and physical addresses may be set during device installation or during system commissioning on the H-312 unit. Through the usage of a unique hardware address duplicate logical and physical addresses are detected automatically (only CTB and CTL). 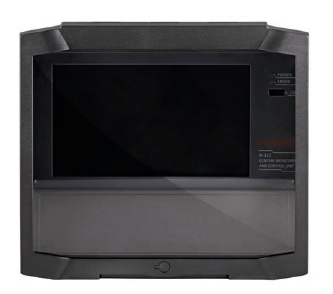 The H-312 is equipped with a classic capacitive 7" touch screen user interface and a built-in web server with secure hypertext transfer protocol. Both allow for data management and visualization of devices (luminaires, expanders, etc.) on the building plan. Equipped with H-314 or H-315 potential-free input modules the H-300 system may control individual luminaire groups to achieve night or stand-by lighting. It is also possible to adjust luminaire brightness in maintained mode (available only for CTB and CTL type luminaires). Schedule based control is also possible. Based on EIA-485 with two-way short-circuit isolation, CT-LOOP allows for robust communication between H-312 and luminaires. The main unit is able to sense which network segment is down (between which devices) and reroute communication from one side of the loop to the other one. This also helps during installation and system commissioning. CT-LOOP permits up to 64 devices per loop with up to eight H-310 or H-311 network expanders between main unit and luminaire. The maximum loop line length (between loop start and loop end) is 1200 meters. As for CT-BUS there is no limit of network expanders beside the physical constraint of 64 devices per loop. 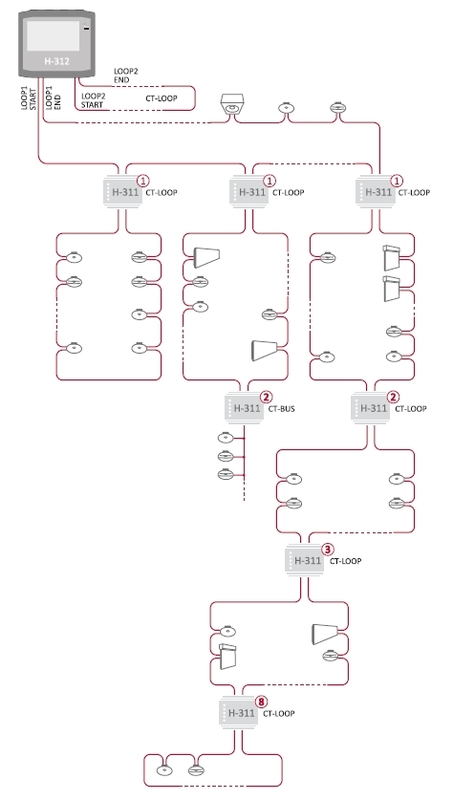 Network expanders H-310 or H-311 may also be used for transition between CT-LOOP and CT-BUS. Transition from CT-BUS to CT-LOOP is not possible. CT-BUS is a network topology which uses the EIA-485 communication standard. Devices are connected in a bus-like topology. CT-BUS allows to connect up to 120 devices (luminaires, network expanders, etc.) on a single bus with a line length of up to 1200 meters. The device count may be further increased by means of intelligent network expanders H-310 or H-311. Up to eight network expanders can be nested between the main unit and luminaire. There is no limit to the number of network expanders beside the physical network constraints of 120 devices per line (either H-312 or H310/H-311).